Ontario is Walleye Fishing Country! 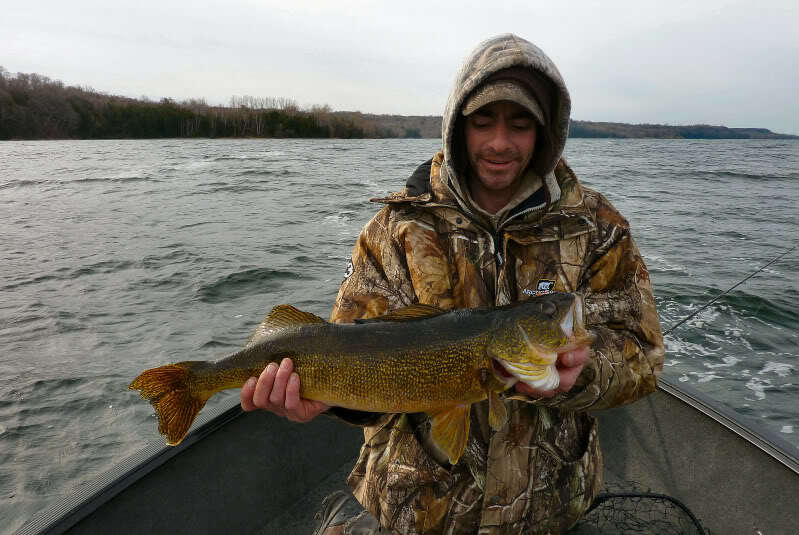 You can find great action for these tasty, golden fish in a variety of settings, from the Great Lakes to shallow and fertile cottage-country reservoirs, to deep, clear rivers and lakes on the Canadian Shield. Fishing begins in late spring as post-spawners concentrate at river holes, river-mouths, inlets, rocky shorelines, sandbars, shallow reefs, sunken islands, and emerging weedbeds. Using jigs weighing 1/8- to 3/8-ounce, dressed with soft-plastic twister-tail or shad bodies, marabou feathers or bucktail, is one of the easiest and most effective ways to fish. Hungry walleye dispersing from spawning areas seldom refuse a jig, especially when tipped with a minnow or a worm. Vertical jig or cast to rocky shorelines, shoals, and weedlines. In stained lakes, chartreuse, lime green, yellow, pink, and white are effective jig colours. When adding bait, use a stinger hook to catch walleye that strike short. During the late-spring/early-summer peak walleye bite, these fish also hit a wide variety of minnow plugs and crankbaits that imitate shiners or yellow perch, one of their main forage bases in many lakes. These lures can be cast or trolled around shoals and weedlines. Walleye love live bait, and a variety of slip-sinker and bottom-bouncer rigs can be used to put a minnow, worm, or leech in front of them. Drift with these rigs when wind or current allow it, back-troll, or inch along with an electric motor or small gas kicker. By mid-summer, walleye travel to deeper structure, such as sunken islands, main-lake points, dropoffs, shoals, and mid-lake weedflats. Spring tactics and baits still take them, but are usually fished deeper, so heavier jigs, rigs, and deep-div-ing lures are called for. 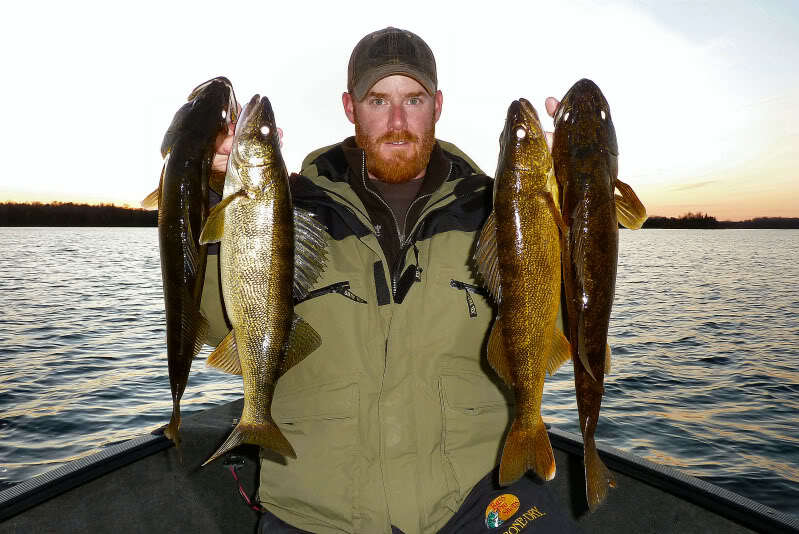 Summer walleye often move shallow on cloudy and windy days, and morning and evening are always prime times. One method of fishing shallow reefs and wave-swept shorelines is to suspend leeches, worms, or minnows on a single hook beneath a slip-float. Anchoring upwind of the structure or shoreline assists in making a stealthy presentation. In autumn, many walleye move deeper and gorge on forage fish, including ciscoes, smelt, and perch, which have grown in size over summer. In general, a move to larger baits in fall pays off. Three- to 6-inch minnows excel when attached to slip-sinker rigs and back-trolled or drifted over key structures, or used on jigs for vertical presentations. Search for reefs topping off at 15- to 30-foot (4.6 to 9.1 m) depths. Trolling crankbaits is also a great way to catch trophy-sized fall walleye. In clear water, use natural finishes on crankbaits, such as black, metallics, and white. In stained or silted water, brighter fire-tiger, chartreuse, oranges, reds, and greens work well. Walleye are some of the finest-tasting fish in the world. Nothing beats a shore lunch of fresh walleye pan-fried over an open fire. It’s an Ontario tradition you just have to sample.